The Kaya Guneri 2 gulet is a Bodrum based Turkish boat, accommodating up to 14 guest in 6 spacious and luxury standard cabins. She was recently refitted (2013). Ideal for family and friend groups. She offers full sails, in great condition, very clean and well maintained. The Kaya Guneri 2 gulet is served by a great crew of 3, available around the clock to take care of your needs and requests. All cabins provide air conditioning, and private bathrooms with shower and wc. The boat is thoroughly spacious with ideal area for lounging as you please. 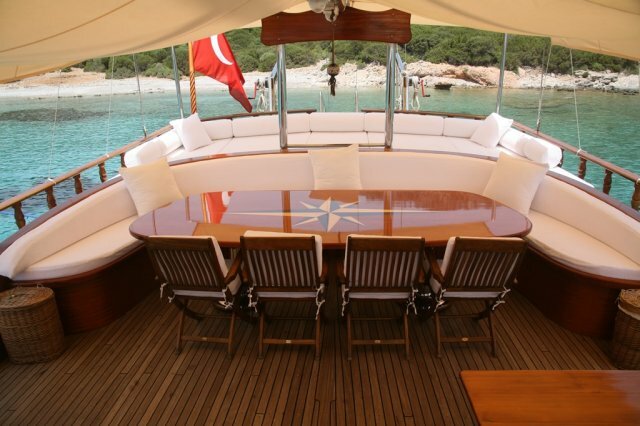 Guest can enjoy the comforts of the aft with large sized cushions and relaxing alfresco dining area. While the forward is fitted with sunning mats for each guest to enjoy the Mediterranean sun and scenery. Crew quarters are separate.